If there’s one amazing thing about this season of DuckTales, it’s its willingness to really push its narratives in wildly unexpected directions. Who would have expected that Scrooge’s most defining behavior–being bitter and angry at Christmas for just existing–would just be an act for the guy to party in the past with the three Christmas spirits from from the apparently-now-canon Mickey’s Christmas Carol? And who would have expected that “Last Christmas!” would mostly stick to the past, turning one of said spirits into a slightly psychotic, self-absorbed, clingy villain? And that young Donald was, at some point, an emo kid who was terrible at writing songs? 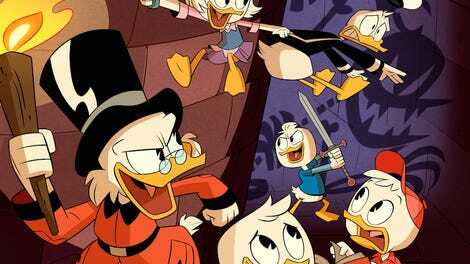 Backing up a bit, “Last Christmas!” is the current iteration of DuckTales’ attempt to blend its nostalgic love for its past with the narrative developments of its present to hint at the potential depths of its future. And while this season has been stronger in playing around with its history for more contemporary storytelling, it does still struggle a bit with its focus. Splitting the story between Scrooge and Dewey as they go on their own unique adventures in the past is a bit jarring, mainly because there’s an emotional resonance that is never given the chance to breath. I’m speaking of Dewey’s very clear pain at recognizing that he won’t see Della at Christmas, and the rich reward of hanging out with her younger self, even thought they’re being chased by that deadly Wendigo. Really, the Scrooge narrative is the set up for the Dewey narrative, and it’s not a particularly smooth connection from the one to the other, but when it works, it works, especially if you’re the kind of viewer who is willing to just go along for the ride. After Scrooge expresses the very expected irritation at all things Christmas, he retreats to his room. Meanwhile, Dewey is already in his room, alone, looking at a photo of Della, wishing for time to be with her during the holiday. Donald bursts in, seeing Dewey hide something under his pillow, and when he forcibly checks to see what that thing is, he sees the photo. The nuance of that moment is powerful, made even more painful when Donald, clearly, has no idea what to say to comfort his nephew, and leaves him alone to himself. (Donald, amazingly, has been DuckTales’ surprisingly most emotional lynchpin, so it’s pretty disappointing that we really don’t get Donald’s take on all this.) Dewey then sees Scrooge chilling with his spirit buddies, and hitches a ride on Christmas Future’s robe as they trek off into the past. This is where things get both wildly ambitious and a bit jittery. Scrooge reliving his business-Christmas party is a mixed bag for the old miser. He’s comfortable seeing his old self (and his old self as comfy seeing him), and while he enjoys seeing everyone having a good time, he’s still stuck being the wealthy center of attention, having to “mingle” with corporate bigwigs and dealing with desperate people willing wanting him to “invest” in their terrible ideas (he even misses a chance to talk with Goldie). 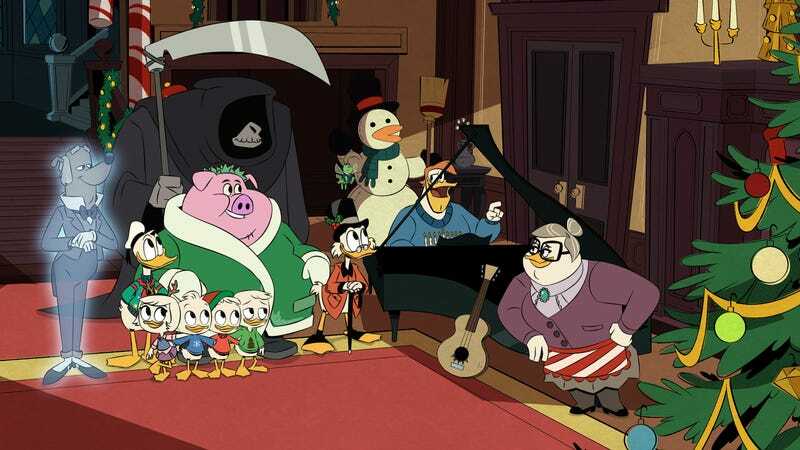 So with Christmas Future hanging with Beakley and Christmas Present rolling with the random Beagle Boys who rob Scrooge for restitution from their “stolen” land (which we learned in “McMystery at McDuck Manor!” and really needs to be expanded upon one day), Scrooge goes off with Christmas Past, away from the noise and distractions, only to end up bored. He thinks this is a lesson about dealing with minor inconveniences to enjoy the excitement, but it’s not; Past just wants to hang with Scrooge basically forever (since other Scrooges move on after learning their lessons). I don’t think any other take on A Christmas Carol went in this kind of direction, and I kind of wish that, given how this played out, the episode just focused on the spirits being completely off and bizarre. Instead, we follow Dewey, after hitching a ride on Christmas Future’s robes and falling off, who wanders into a different past at the mansion and stumbles on young Donald, who is at this point an emo loner teen with terrible songwriting skills. Sporting the voice and mannerisms of the triplets from the original DuckTales while maintaining Donald’s overt clumsiness and anger (which is a hell of a clever idea), he is convinced by Dewey to find his sister Della, mainly so the blue triplet can see her mom in some manner. But they run into the Wendigo, and while being chased and captured by a net, they find Della indeed, who is just as adventurous as Webby. Della is hurt because Donald never joined her on their outing, and while it’s a strong moment between those two siblings, I don’t think it makes the Dewey-loner parallel work (Dewey’s aloofness is based on a real emotional beat, and I think it’s a little disingenuous to imply Dewey was in the wrong for wanting to be alone). But still, the three of them overcome the beast and take him down. And when Donald and Della (who recognizes Dewey is indeed a future Duck that has come back to the past) make up and go inside, the Wendigo awakes, ready to pounce. Scrooge arrives and stops him though! In a perfect cane stomp against the head, the Wendigo breaks open and it’s revealed to be Christmas Past, who has morphed into this obsessive, desperate beast over the years. But Scrooge, soft-hearted, is willing to forgive him since no one should be left behind at Christmas. It’s a wonderful sentiment, although it kind of feels a bit rushed for an ending, and on the whole, the two parts feel just too removed from each other, despite the attempt to make them come together in the end. The implication that adult Donald knew and remembered Dewey from his past is a nice touch, but again, without Donald expressing anything reassuring or honest to the nephew that clearly is hurting the most from Della’s disappearance, it feels like a missed opportunity. (Even expressing the idea that Donald doesn’t know how to do something like this would be informative.) “Last Christmas!” gets lots of points being out-there at least, and the animation is incredible for a season that has being churning with incredible visuals. It if could just tie a tighter bow on those emotional gifts, though, then that would be the biggest Christmas miracle of all. Is young Donald being an emo loner kid canon in the comics? I can’t imagine that being a thing. I love how the episodes glosses over all the potential time travel nonsense, although the “don’t warn past figures of the future” is clearly the most important rule. I believe a lot of those wannabe-investors were various characters from the old show and/or comics; I definitely remember the sea captain guy from OG DuckTales. Contributor, The A.V. Club, with a clear preference for all things cartoons; check out his main blog at http://www.totalmediabridge.com.